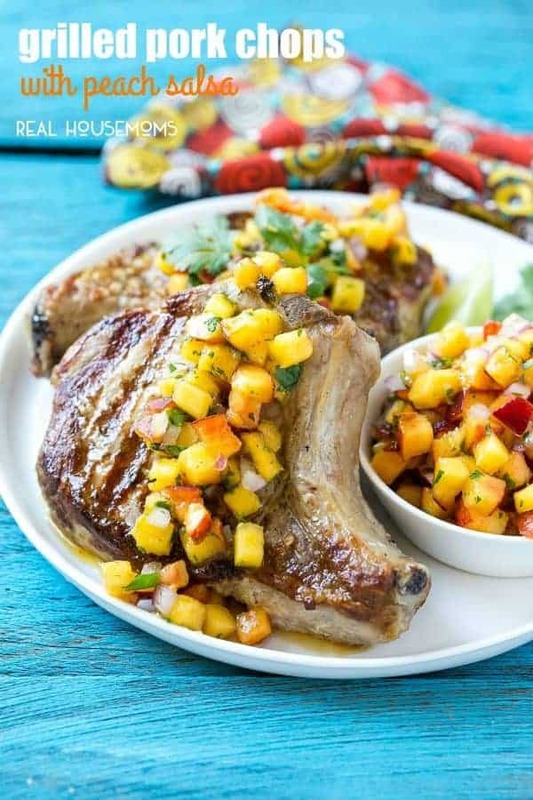 These quick and easy GRILLED PORK CHOPS WITH PEACH SALSA are the perfect main course for a summer barbecue. The peach salsa takes just minutes to make and elevates these pork chops to company worthy status! Now that the weather has warmed up I am constantly outside grilling up everything I can think of! We grill at least once a week during the summer, but sometimes I get tired of all the hamburgers and chicken breasts. I picked up these succulent bone-in center cut pork chops at the market the other day and tossed them onto the grill to cook to golden brown perfection. 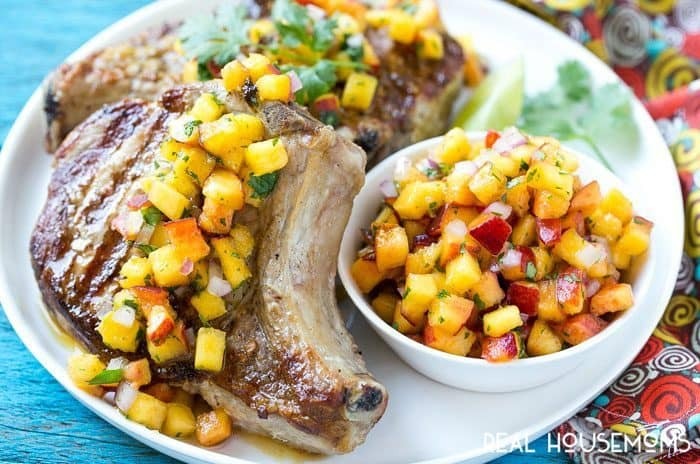 Grilled pork chops are great on their own, but when you add a summery peach salsa on top you end up with a gourmet meal with very little effort. Let’s talk about the meat first – bone-in pork chops are the way to go for grilling, the bone helps to keep them from drying out. I season the pork chops very generously with salt and pepper, brush them with olive oil, and then onto the grill they go! You can get creative with the seasoning for your chops – a Mexican seasoning would be fabulous, or even a little garlic or onion powder. Not all pork chops are created equal when it comes to size. I’ve seen pork chops as thin as 1/2 inch or as thick as 3 inches. I recommend buying pork chops that are approximately 1 inch thick for this recipe, if the chops are too thick the outside will burn before the inside cooks through. I have been putting this peach salsa on everything lately – it’s great with chips, on top of chicken, or even on a salad or sandwich. My favorite way to eat peach salsa is on these pork chops, pork and peaches just go so well together. If you like a little spice, feel free to add some minced jalapeno to the salsa. 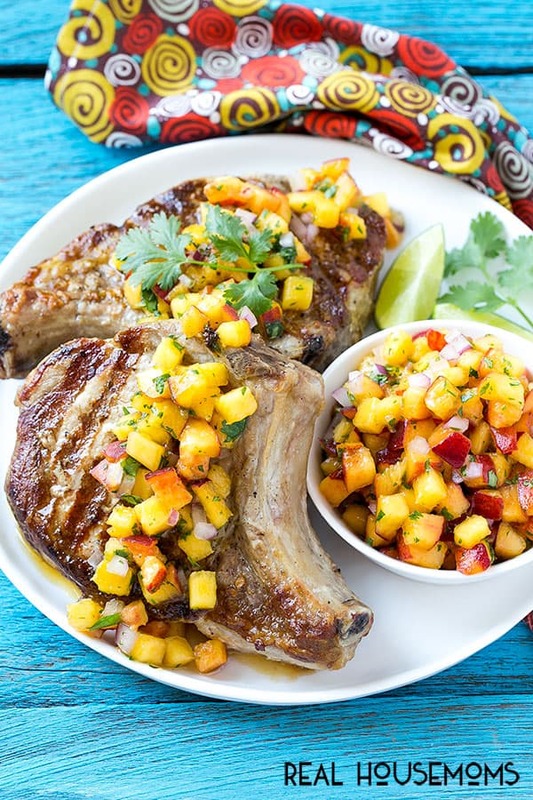 These grilled pork chops with peach salsa are the perfect centerpiece to any summer meal. Nothing screams summer like peaches, and pairing them with pork chops is a unique way to dress up your dinner. Preheat a grill or grill pan to medium high heat. Drizzle the olive oil over both sides of the pork chops and season generously with salt and pepper to taste. Place the pork chops on the grill and cook for 6-8 minutes on each side or until a thermometer registers 160 degrees. In a bowl combine the peaches, red onion, cilantro and lime juice. Add salt to taste. Salsa can be made up to 8 hours in advance. Spoon the salsa over the pork chops and serve immediately.